And I want to go back and I will. 2. CUISINEZ L'ORIGNAL A LA MODE DE FORT CHIPEWYAN : MOOSE IN A BLANKET ! The Bathurst and Porcupine Caribou herds share an unfortunate fate: their calving grounds are found in territory believed to be rich with the resources that make our economy tick. Exploiting those resources without some negative impact on the herds is simply not possible. To date, the Porcupine herd has been reasonably well protected by both Canada and the U.S., although pressure to develop their calving grounds is intense. The Bathurst herd, on the other hand, is in trouble right now and Canada's response may only make matters worse. In late 2001, the U.S. administration was driven to respond to new energy security concerns following the September 11, 2001 terrorist attacks. It began looking in earnest toward oil drilling in the Arctic National Wildlife Refuge (ANWR). The ANWR is located in the northeastern corner of Alaska, along the border with the Yukon Territory. 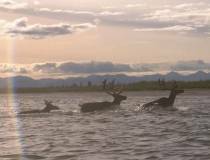 The Porcupine Caribou herd calves in the ANWR and migrates into the Yukon on its annual trek. Aboriginal peoples in both jurisdictions and the Mackenzie Delta of the NWT depend heavily on this herd for subsistence. herd calves in the area of Bathurst Inlet, a long, deep inlet in our coastline just south of Victoria Island. The inlet and calving grounds lie in the westernmost portion of Nunavut but the herd, like its western cousin, migrates across a border. The Bathurst herd migrates far south into the Northwest Territories. Many Aboriginal communities in the NWT still depend on the herd as their sole source of fresh, nutritious meat. Far fewer Inuit in Nunavut hunt the herd. Nunavut wants to build a deep-sea port right in the calving grounds of the herd, where it would be used to store fuel oil for resupplying mines and communities and store metal ores for shipment to smelters. It wants to connect the port site to the mineral and diamond-rich territory to the southwest by a 215 km all-weather road-a road that would pass through the migratory route followed by the Bathurst Caribou herd from April through October. This idea, in one form or another, has been around for a long time. Funding from the (former) Government of the Northwest Territories kept the idea alive through repeated study during the 1990's at a cost of a couple of million dollars. In 2001, the Federal Government granted over $3 million for a feasibility study through Indian and Northern Affairs (INAC), the Ministry responsible to protect the North and develop the North. This Ministry will ultimately be responsible for deciding whether or not the project goes ahead, because the developer needs federal funds to make it work. CARC believes the federal government's position on the protection of caribou calving grounds should be consistent and principled. We cannot seriously expect to pour money into developing our own calving grounds and yet prevent the U.S. from doing the same. The environmental assessment process. The Kitikmeot Inuit Association's development corporation is the proponent of the Bathurst Inlet Port and Road Project (BIPAR), and it isn't interested in seeing its proposal go to a joint environmental review with the Northwest Territories. It has urged the Nunavut Impact Review Board to conduct a "Part 5" assessment under the Nunavut Land Claims Agreement. The Board has thus far agreed, that a public review is necessary, and has suggested that a Part 5 review is adequate. The Minister has also heard from the Government of the NWT, several Aboriginal communities in the NWT, the Bathurst Inlet Port and Road Committee, the Mackenzie Valley Environmental Impact Review Board, WWF and, of course, CARC. All correspondents have strongly urged a joint or "Part 6" review, with intervenor funding to enable meaningful participation of Aboriginal and non-governmental organizations and communities. There is no guarantee of participant funding under a Part 5 review, no provisions for appointments to the Panel from outside Nunavut and no requirements for Public hearings outside of Nunavut. The costs and benefits of the project. The BIPAR was originally intended to link a base metal deposit at Izok Lake with the proposed port, making it profitable to develop this and many other mineral claims in the area. Metal ores are far too heavy to fly out for smelting so, unlike diamonds and gold, these deposits can generally only be mined when cheaper road and/or water transportation is available. The owner of the Izok deposit, Inmet Mining Corporation, was initially interested in partnering in the project but, when the price of base metals recently dropped, they dropped the project, too. Now, the project is changed: the proponents say they won't complete the link to Izok Lake. That may make immediate economic sense to them, but it also defeats the development value of the project. The point was to create jobs in construction and mining. Now, it seems the point is only to deliver fuel oil to the Diavik and BHP diamond mines at a cost reduction of $0.20 per litre. Both mines were extensively (if imperfectly) reviewed during their approval processes, and were expected to be profitable without this fuel cost reduction. There are a lot of questions to be answered here, by whatever means of review is chosen. The first one would be, "should we do this?" Is there truly economic development potential here, that outweighs the risks involved in taking oil tankers through the Northwest Passage, moving toxic metal ores through the barrenlands, and disrupting the migration and calving of the economically important Bathurst Caribou herd? Is there a better sustainable development strategy that the Kitikmeot communitites could pursue, that would not leave the region subject to the boom-and-bust cycles of mine development? Our second question would be "if there is a good economic reason to develop the road and port, can it be done elsewhere, with fewer impacts on the herd and the marine mammals and fish of Bathurst Inlet?". Could the road be simply a winter road, to avoid impacts on caribou and the grizzly population? Could the road be routed so as to be outside the Bathurst caribou herd calving grounds? The problem is that none of these questions can be answered easily, because there is no common ground as to what impacts on the ecology, society or economy of this region will be considered acceptable, either locally, in the Territorial capitals, or in Ottawa. These are questions that CARC is striving to answer with its multi-year programme, Plan for the Land. The climate and the coastlines of the Arctic are changing so rapidly, that we owe it to ourselves to ensure that any long-term infrastructure project such as this is assessed with the utmost care and foresight. The cumulative effect of this development, and all of those likely to spring up around it, combined with climate change, may well put the Bathurst herd 'over the edge'. For further information, please contact the Canadian Arctic Resources Committee. Credit : Arctic Resources Committee: http://www.carc.org. 5 lb moose rump roast. Cream the butter, adding parsley and cayenne, then working in the lemon juice. Wipe the roast with a damp cloth. Make deep slits in the meat and insert the cubes of suet. Make a pastry with flour and water; roll out to a sheet large enougth to encase the roast. Smear the butter mixture on the roast, wrap it in pastry, and seal the seams. Bake on a roaster rack at 300°F for two and a half hours. Remove the lower part of the pastry blanket to allow juices to escape into pan. Mix together the dissolved vegetable extract cube, hot soupe and melted jellies and add to the pan. Increase heat to 450°F and cook for a 30 minutes, basting every 7 to 10 minutes. Add the whipped cream just before serving, if desired. This recipe makes 10-12 portions. You can substitute with any wild game or commercially farmed meat. Note du Webmaster : Cette dernière phrase devrait rassurer les internautes Francais, car toutes les boucheries ne vendent pas de l'orignal !